The Corporate and Foundation Relations (CFR) team bridges the organizational and academic medical worlds by creating system-wide partnerships. This team manages the relationships between Penn State Health and Penn State College of Medicine and foundations and corporations. Its goal is to work collaboratively with corporate and foundation partners in research, education, patient care and community outreach. 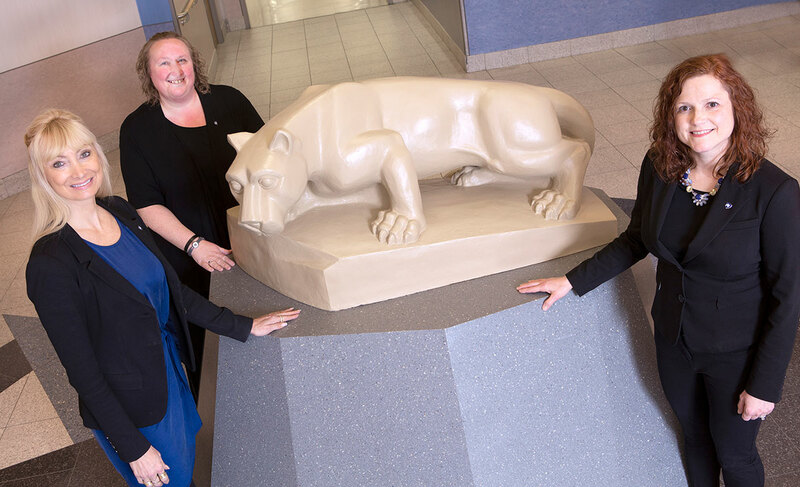 Corporate and Foundation Relations at Penn State College of Medicine includes, from left, Vicki Deitzler, director; Kelly Frownfelter, administrative support coordinator; and Jessica Kiely, associate director. Corporate and Foundation Relations (CFR) in the Office of University Development strives to establish and maintain partnerships with corporate and foundation funders through effective cultivation, solicitation and stewardship. CFR will be able to provide up-to-date information that could affect strategy and timing as well as provide additional information based on foundation relationships. This can impact the success of your proposal. In addition, some external funding sources accept only a limited number of submissions from each institution, and there are a number of foundations with specific protocols in place. Investigators interested in submitting a proposal to a corporation, foundation or organization (non-governmental funder) should contact CFR first. This catalog offers an overview of some of the many foundation funding opportunities available. Click the + next to each item to see details such as career level, limited submission status and funding topic. Those interested in pursuing funding from one of these foundations should contact the CFR team member listed. Foundation Directory Online is a service of the Foundation Center offering information on more than 140,000 grantmakers. To request access to Foundation Directory Online, email cfr@pennstatehealth.psu.edu. This access is for the exclusive use of departmental research administrators. Investigators are encouraged to contact their grant specialists to search for funding opportunities. The Corporate and Foundation Relations team helps foundations navigate the institution, find faculty and programs of interest, and arrange for campus meetings, tours and convenings. The team matches Penn State Health and College of Medicine strengths and priorities with foundations’ interests in the areas of research, academic programs, patient care and community outreach. The CFR team works closely with corporate partners to identify win-win collaborations and opportunities that advance the mission of both organizations. Corporate and Foundation Relations is conveniently located 15 minutes from Harrisburg International Airport (MDT), on the campus of Penn State Health/Penn State College of Medicine in Hershey, Pa.